The Saturday Night Genealogy Fun task was to go to My Heritage Celebrity Collage, choose a photo and then have the program do a face recognition match with celebrities. I chose to use my Mother’s photo from the mid-to-late 1930s. I did one of me as well and one of my matches, which was also Mother’s match, was Florence Henderson. Mother always loved the movies and, in fact, patterned her style of appearance based on movie stars – both what she knew of their real lives and on characters they portrayed. The only two of her look-alikes she would have been familiar with were Rita Hayworth and Florence Henderson. 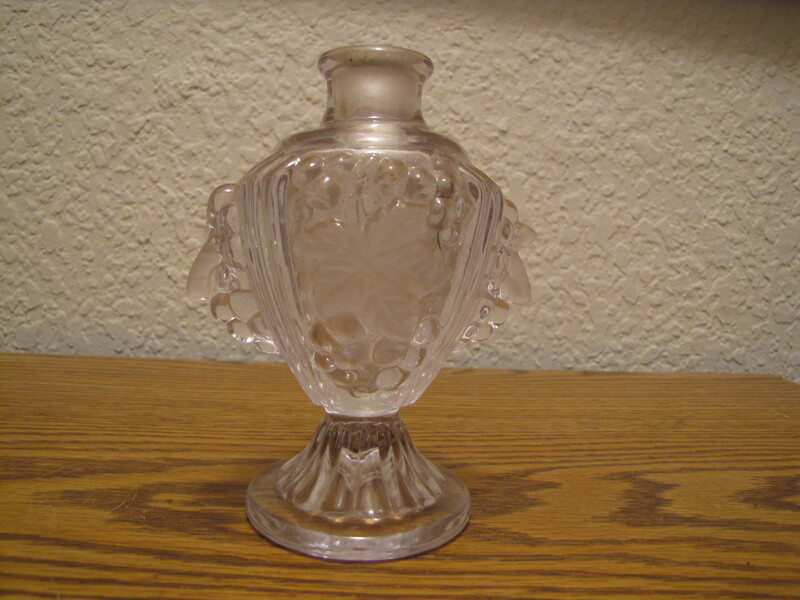 As far back as I can remember [1944-1946ish] Mother (Virginia Amy Lineberry) had the perfume bottle pictured on the left – it originally had a glass stopper. It has been in my possession for many years now – again, I’ve had it so long I no longer remember when she let me have it. Though I don’t know if it was originally just an empty container to be filled with perfume or if it came with a perfume in it, I know it was a gift to Mother from Daddy [James Thomas Willis] for the perfume Tabu. Daddy apparently liked that fragrance and gave it to her off and on for many years. I assume Mother originally like the fragrance, but in later years she seemed to grow tired of it though, according to her, it remained Daddy’s choice for a perfume gift for many years. She also had the dusting powder to go with it. 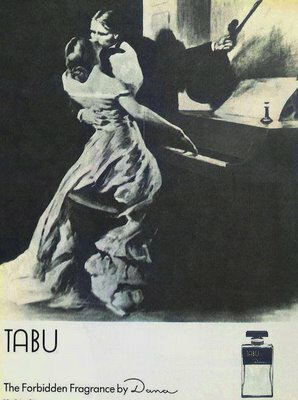 The Dana company moved from France to the United States in 1940 and the Tabu fragrance has continued to be available to the present time, though it is now mostly found as an inexpensive drugstore cologne. Update December 2014: This item is now only a memory. 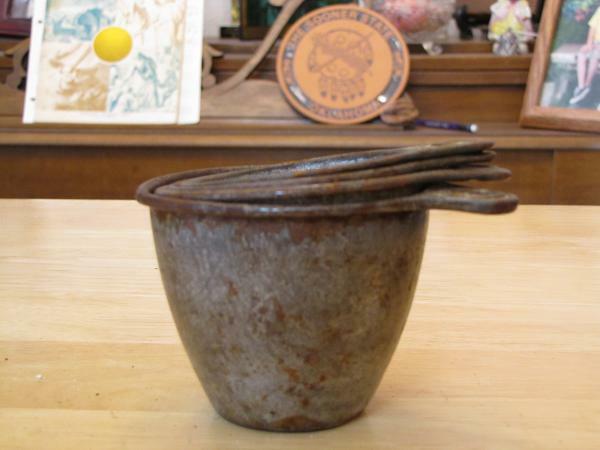 I’ve had my Mother’s nested metal measuring cups for quite some time – I don’t know when or where she got them nor do I remember when she gave them to me or why. All I know is I don’t remember a time when they weren’t a part of our kitchen. Mother talked several times about going shopping with Daddy for groceries and a few household necessities when they first set up housekeeping. Mother had a great memory for small details and her story included the total expenditure for all their initial household setup, though I no longer remember the amount. Mother had experienced the depression when affording supplies of all kinds was very difficult so I suppose being able to buy everything she needed to establish her home was a momentous event. I would guess the cups were a part of that initial purchase in December 1938. 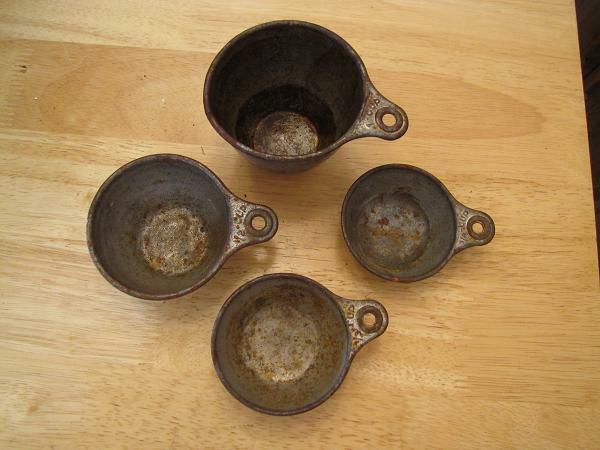 They were made of some sort of metal that has rusted over the years, most likely after I started washing them in the dishwasher. I searched online for any information about the origins of measuring cups or the materials that might have been used or the manufacturer but I didn’t find anything [other than one Ebay sale of only two pieces of a set that looks like Mother’s]. Though I have a set of yellow Tupperware nested measuring cups I used for a good portion of my years as a married housewife and mother, I now most frequently use Mother’s, probably because of the connection I feel to her when I do. Update December 2014: These are now in Kay’s (Relative Storyboard) home. My daughter Kay’s blog about the 1950s era alarm clock my parents used, which matched their blond bedroom set, reminded my brother of the blond TV. Our mother was always a modern woman who adapted to and loved the newest appliances and conveniences. Though I had forgotten the specifics of the TV, other than the fact it was blond, Mickey remembered it also had a radio and phonograph player hidden within its cabinet with doors. It was a Hoffman and I found a 1950s era Hoffman television ad that, if not identical, would have been similar to what Mickey was describing (the ad was larger but I just selected the pertinent one).There were doors to close when not in use, radio and television controls on the right and the phonograph, which played 78’s, 45’s and 33 1/3’s was in the bottom left drawer. 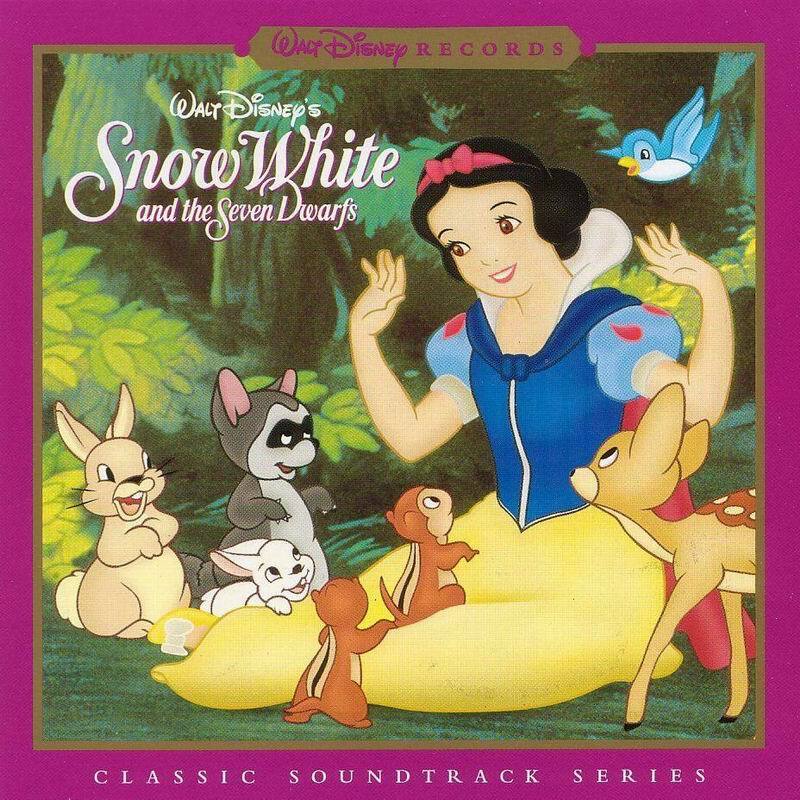 Mickey talked about listening to the Snow White album as narrated by Dennis Day, which came out around 1950. I do still have the record (picture below), though the front of the album cover is gone (cover photo from Internet below) as well as the 24-page color booklet. I, too, loved that album and listened to it for perhaps 15-20 years or more – the records are almost slick. I particularly enjoyed “I’m Wishing [Snow White’s duet/echo from the wishing well] and One Song,” “Someday My Prince Will Come,” “Whistle While You Work,” and “Heigh Ho, It’s Off to Work We Go.” I have to say, some of the Disney songs shaped my positive outlook on life and my work ethic, including these from Snow White, but also tunes like “Zip-a-Dee-Doo-Dah” from Song of the South. As I entered my teen years, I used that phonograph to play rock ‘n roll songs as well as continuing to play Mother’s opera, operetta and pop recordings of the 1930s and 1940s – a couple of favorites being “Donkey Serenade” and “Pistol Packin’ Mama”. Mother coped with most of the music of my teenage years, with the exception of my Jackie Wilson songs – as a musician, she hated the repetition of phrases that were a part of his style. I do still have all Mother’s records that survived [she said one of my cousins laid out a number of her records and walked on them to break them, as well as breaking several of her figurines]. 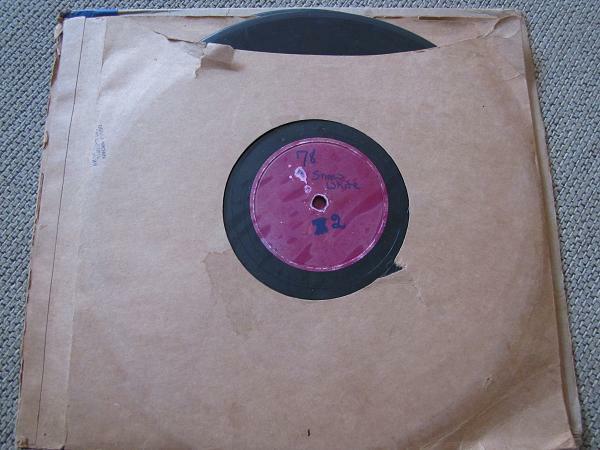 At some point I disposed of all my 50’s era 45’s – so much for maintaining what would have been a valuable collection! My brother, sister-in-law and I stopped by Fort Reno yesterday on our way to Enid and while there we drove to the Fort Reno Cemetery. The fort has been unused for many years and most of the people buried there died in the early part of the 20th century. There seemed to be an inordinate number of infant and young children’s tombstones; I suppose indicative of the precariousness of life for children during the pioneer era of our country. A portion of the cemetery was separated by a stone wall with a metal stile inserted for access. We noted the names on the plain tombstones were all either Germanic or Italian in origin. A little Internet research indicated Fort Reno had been an internment camp during the World War II era. Although only one prisoner died while housed at Fort Reno, 62 Germans and 8 Italians from other such internment camps are buried along both inside walls of the stone barrier in the west section of the cemetery. My mother-in-law, Ottie Geneo Rury Brown, was a kind, loving and giving woman whom I dearly loved. Her generous spirit impacted me deeply. I read again this morning the quote and life principle she tried to live by and pass on to her children by word and deed. It was a poem written in 1845 by Julia Abigail Fletcher Carney. The first stanza of it was to be published as “A Letter to Sabbath School Children.” On the day it was to be published she had a ten-minute writing exercise and added the second stanza. The poem as a whole she called “Little Things” and it was reprinted in the McGuffey Reader (by which most people of Ottie’s generation learned to read). She knew and understood fully that the little choices we make each day ultimately make us what we become – each decision counts. She was a treasure and I was truly blessed to have been a part of her family.